Once again Warehouse Liquors in Chicago proves that they know what they're doing when it comes to picking barrels. 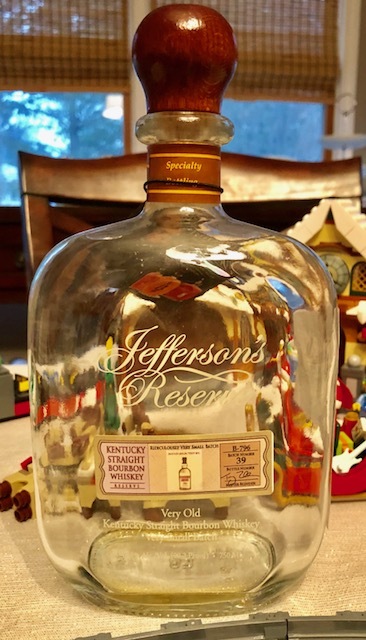 Having never run across a private select from Jefferson's, and being a fan of Jefferson's generally, I had to pick this one up and give it a loving home. The nose was interesting. It had almost a cola scent to it. It smelled like a Vanilla Coke, just with not as much vanilla in it. It was sweet with absolutely no burn. The notes were subtle, and it certainly wasn't pungent, but what was there made me eager to try my first pour. Unfortunately, I went in with high expectations, having loved every other private selection I've tried from Warehouse Liquors, and initially this one underwhelmed. It came across as soft and simple, with no complexities and very straight-forward flavor. Initially I got a bunch of amaretto flavor, but on the sweet and mild side. It was almost candy-like in this way, though I just couldn't think of a candy to compare it to. I also got notes of milk chocolate and caramel, and while all of this sounds good, each of these flavors were soft and muted, and I really wanted more from it. However, as I made my way through this bottle over the next few weeks, this bourbon just got better and better as I went. What was disappointing at the start, ended up exceeding my expectations and turning out to be a great whiskey! The amaretto, which was the most forward flavor to start, seemed to fade to the background, making way for the milk chocolate and even a marshmallow note. It also seemed to get sweeter and sweeter as it went. The last few pours were like drinking candy corn and buttery marshmallows. 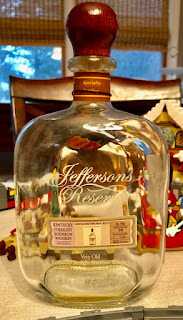 It also maintained a cereal quality, like Corn Checks, throughout, that, when mixed with that buttery marshmallow, made this a dessert-like whiskey that I found myself craving. It was as though I developed a sweet tooth for this whiskey. Considering the first few pours were underwhelming, I nonetheless give this whiskey a high grade because of just how strong it finished. By the end I found myself wishing I had grabbed another bottle for future consumption. This is one of those bottles that reminds me why I prefer writing my reviews only after I've finished a bottle.